I thought I would just let you know what’s been happening in the Burgess household over recent weeks. It’s been a very stressful and hectic time spent helping my aunt move into a retirement home near to me. As her next of kin, I have been worried that she was living alone in Hertfordshire and becoming even more lonely as her old friends have died or moved to be near their relatives too. Dougie and I have been trekking up and down to sort out the house move and now she is here, there has been lots to do physically in terms of paperwork and emotionally in terms of helping her to settle in. It’s not been easy and there is still a lot to do with regard to selling her Hertfordshire home but we’re getting there. It was a real treat, therefore, to have two nights in London this week. We had organised it some time ago because we had tickets to the Statoil Masters Tennis tournament at the Royal Albert Hall so we thought we would tie it in with some Christmas shopping. Thursday afternoon was wonderful. 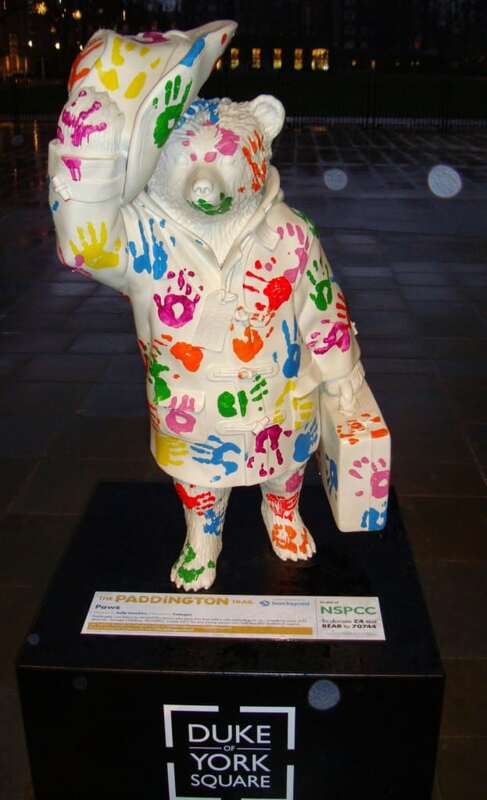 Having checked into our hotel in South Kensington (more on that separately) we had a saunter along the King’s Road, Sloane Street and Knightsbridge. I bought some bargains for myself from the Joseph sale shop, we managed a few Christmas presents, had tea and cream cakes in L’Eto and even had some complimentary Prosecco in one shop, which lifted our mood and opened our wallets. As darkness descended the twinkly lights made the experience much more exciting. 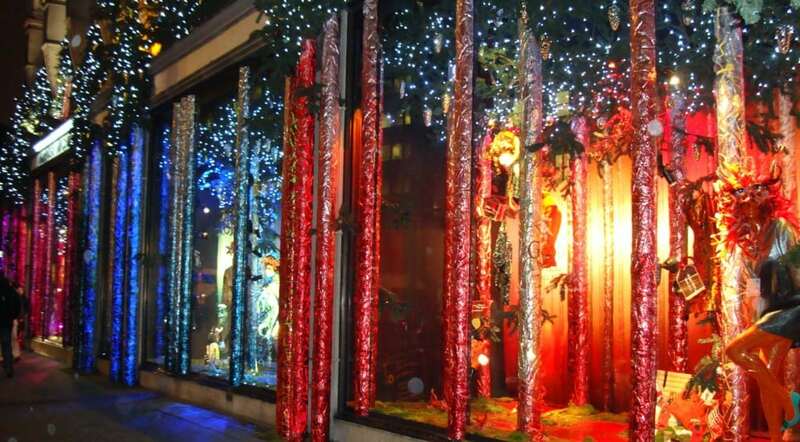 The windows of Harvey Nichols and Harrods were fabulous, people were generally in a good mood and we found a warm, comforting Italian restaurant. Pappa Roma, just off the Old Brompton Road, to end the evening with full-bodied red wine and some time to sit together and relax. Contrast that with Friday which in terms of shopping was a complete disaster. Wandering up and down Regent Street and Oxford Street, not sure what we wanted, too many people – it all became too tiring and stressful. Thankfully we escaped back to South Kensington to change for the tennis and, needing a quick bite, managed to find another super eatery, Franco Manca. Yes, Italian again, but this time purely pizza and, my god, were these pizzas divine and amazing value (sourdough pizzas fired in a special ‘Tufae’ brick oven). They have ten restaurants in the city and are well-worth hunting out. We had seen queues outside this one, on the Old Brompton Road, the previous day, so had a hunch it would be good. It was. 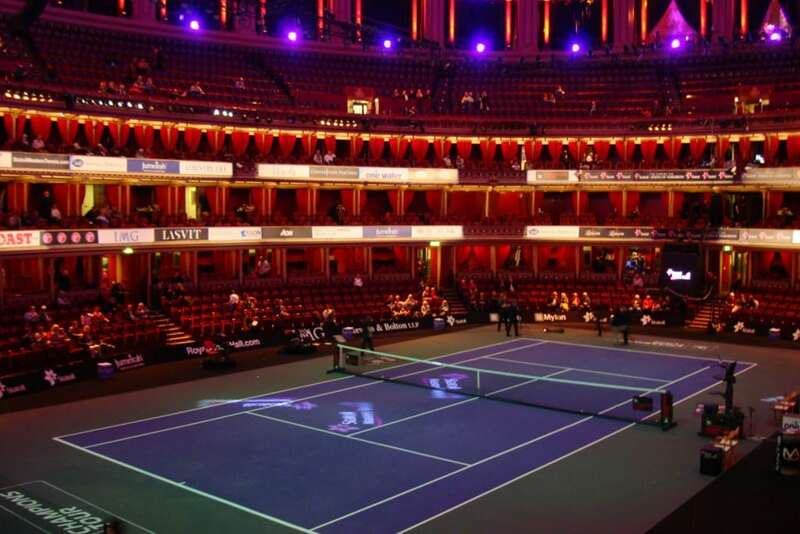 Tennis in the Royal Albert Hall might sound strange but the venue was superb. We had excellent views from our seats in the choir stalls and were treated to an entertaining singles match between John McEnroe and Henri Leconte and a fast and furious doubles match between Tim Henman and Andy Roddick v Jamie Murray and Ross Hutchins. It was televised live on ITV 4 – did you see me? In the meantime, here are a few snaps from our little break-away. L’Eto Caffé – I chose the raspberry one. bound to be one there…there wasn’t (someone missed a trick there, surely). 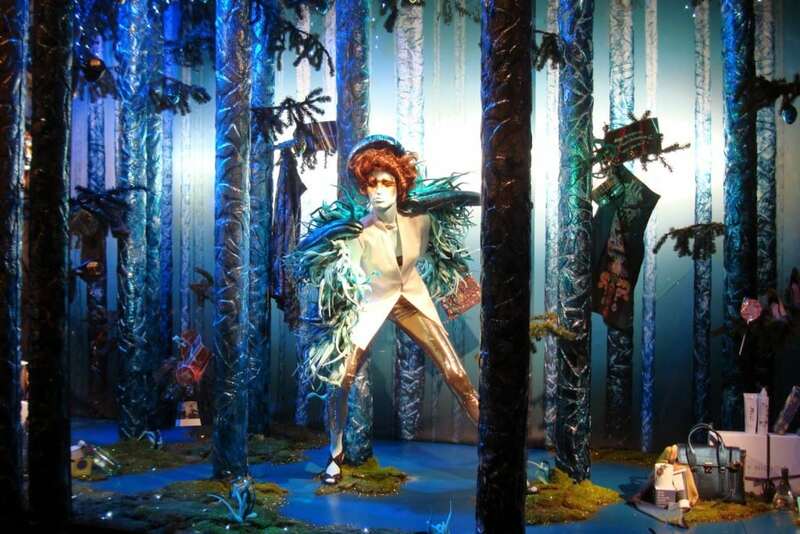 One of Harvey Nichols cool windows. 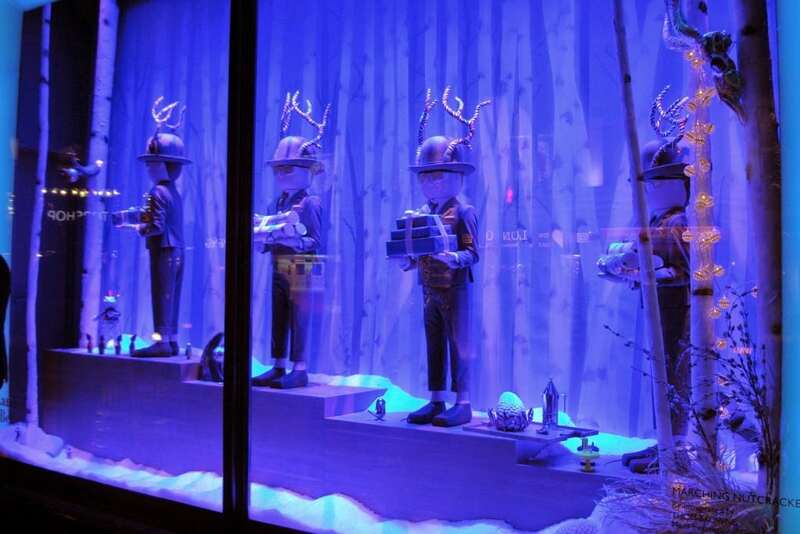 One of Harrods’ windows. My favourite windows, which I forgot to photograph (too absorbed looking at them), were the small ones full of miniature mice scenes – The Land of Make Believe – enchanting. Burlington Arcade – very classy. 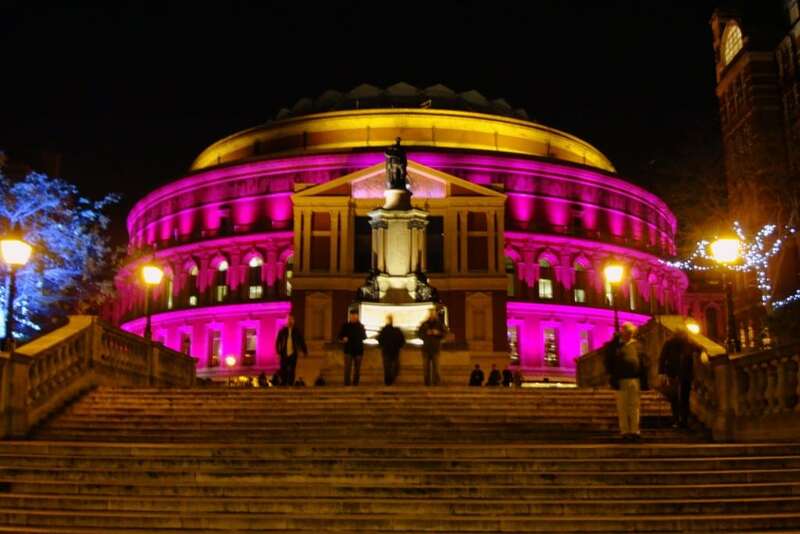 The Royal Albert Hall looking beautiful on a crisp winter’s night. Ha! Yes, we had to decide which items of furniture (and stuff) to put in her new flat, have used our garage/large shed as a holding area for the things she might need and now got to go back this week to clear the rest. Very hard as she is not very mobile (wheelchair and frame) and we have had to sort out carers here plus the usual things you do when people move. Blogging has taken a back seat – just about managed to do my column each week! I've eaten in Pappa Roma, I was definitely alone and link it to shopping in Rigby and Pellers and it being unsatisfactory (I probably didn't spend 'enough' money LOL) Sounds like you had exactly my sort of trip,lovely. No, the meal was great, that's why I remembered it. It was post R&P shopping failure, the corsetry was the let down, which is exactly the opposite of what it should have done!!. Haha! Oh I see! We did pass R&P and I was tempted, thinking of my fraying M&S bras. But maybe I would feel better just buying more cheapy basics and spend my money on pasta and vino! I did feel the urge to sing every so often but Dougie ensured I just cheered and clapped instead. Firstly, what a lovely niece you are to do all that for your elderly aunt. I hope she settles into her new surroundings happily and quickly. Secondly, what fabulous London pics. I'll never need to go to London again since my BFF is moving to NZ come February. I miss our shopping trips but last time we went to Liberty's for tea and scones, we rather grudgingly paid £12 each for the pleasure!! I've just finished off the hamper from Fortnum and Masons that my boss gave me while I was recuperating at the beginning of the year and I'm missing all that expensive food too. I really think I was meant for better things, Trish, I really do! Ah thank you, Nana, I really do appreciate that. I know what you mean about prices. The coffee and cakes I think cost as much as the gorgeous pizzas – so dinner cost less than afternoon tea! But it is nice to have a few treats. I bought my aunt a Fortnum and Masons hamper a couple of years ago for Christmas and she loved it. I might have to think about treating her again with something special – she always did love stylish things. No, that isn't me in the photo, though I quite like her coat. I bought a little wool skirt and a gorgeous cashmere cardigan which was a bargain as it was a sample. Yes, it is a weird time. Just as my responsibility for Rory lessens to some degree, I now have more in another direction! It sounds like you can see the light at the end of the tunnel now with your aunt. I hope she likes her new residence and being surrounded by people. I know my grandmother loved being in sheltered housing and looked ten years younger when we visited her. What fabulous windows. I'm glad you posted the pics as I won't get to see them. They are always so imaginative. Her new flat is lovely in a very smart development but she is anxious about it and misses her own home at the moment. But it was her decision so I hope she settles in ok. I wish I had taken more photos for you to see as they were so pretty. How lovely that you'll have your boy home again soon and (echoing Nana Go-Go) what a wonderful niece you are. I'm glad that you had a fun time in London. I was there last week too and it's wonderful to see all of the Christmas lights and decorations. Thanks for the tip about Franco Manca – I'll definitely look out for those restaurants now. Twelve weeks has been such a long time and yet, with all the work sorting my aunt out, it has taken my mind off it. Yes, the pizzas were so light and amazingly cheap too – small menu, just a few pizzas, but very tasty. That raspberry cake looks divine – look at all that creme patissiere! Oxford and that whole area of London can be a bit of a mare at this time of year – it's way too busy. 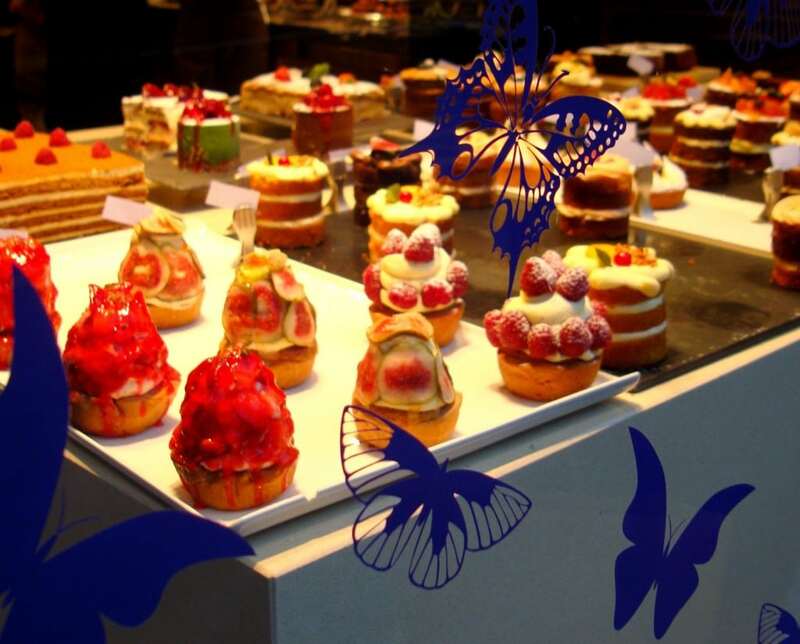 South Kensington has some nice shops and places to eat though – The Kings Road is fab for a good saunter. I never knew the Albert Hall could host a tennis tournament! Ps… I hope your aunt is feeling okay and settled into her new home. Oh, I'm glad you managed to take a few days out and have a mini getaway. I hope you're aunt has settled in? London can be so magical can't it? But I hate the crowds on Oxford Street. If I ever go now, it will be early in the morning before lunch. The tennis at the Albert Hall sounds amazing. I can't imagine the tennis in there… must have been mad! Hope your aunt will settle in OK and glad you had a mostly great time in London. Love your pics. Sigh. Looks lovely. Those windows are gorgeous. Right – I'm just off to buy more stuff on Amazon!